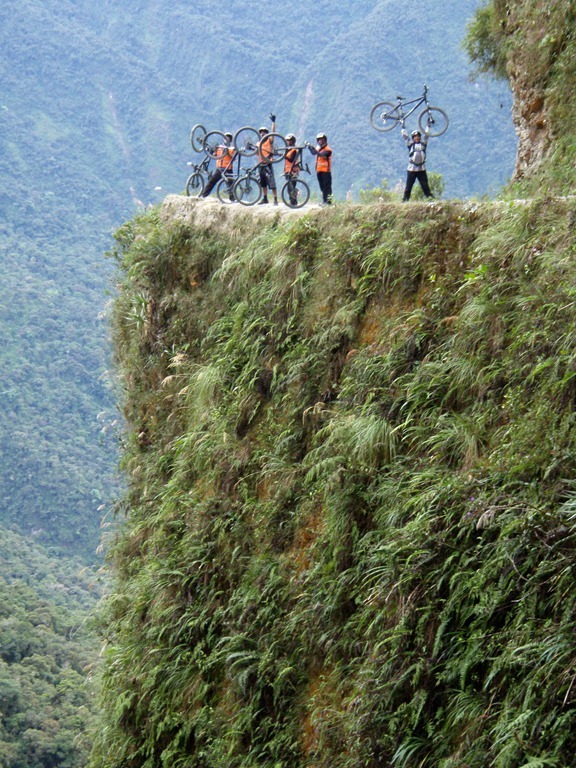 The reason I hadn’t slept well was because of these photographs and many more I’d stumbled across whilst researching cycling along Bolivia’s infamous Death Road. Before I even set foot on this glorious South American continent myself and my trusty travel partner Tom had talked about the many must-do activities which littered each country. 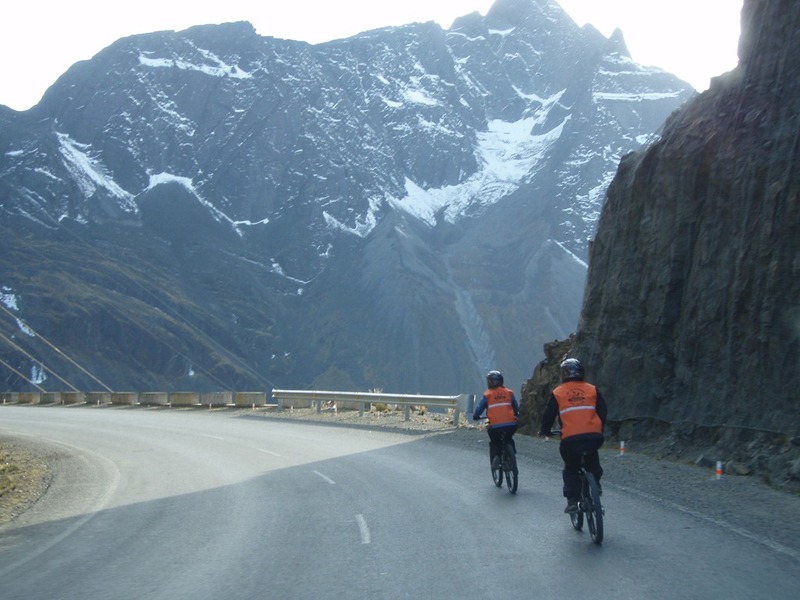 Machu Picchu….definitely, Lake Titicaca…obviously, white water rafting…absolutely, glacier climbing… unquestionably, cycling the Death Road…not sure. 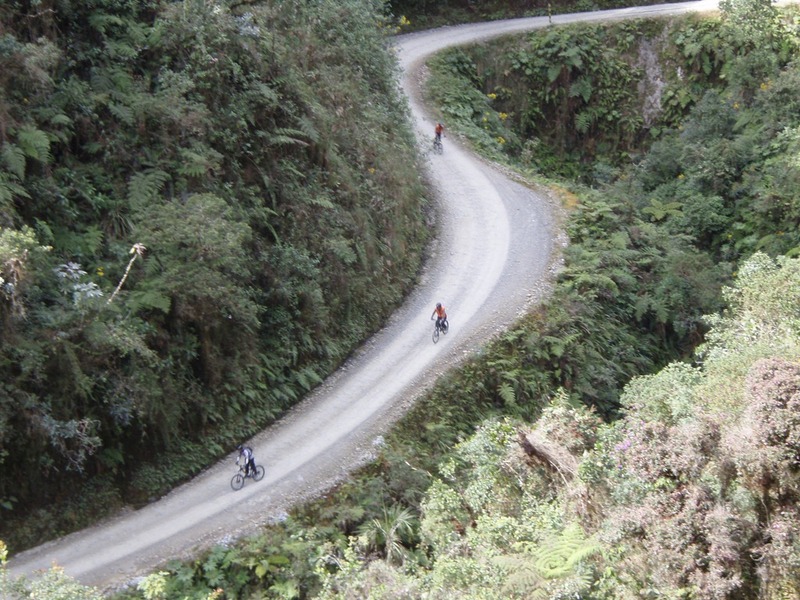 Tom was cycling the Death Road no matter what however I wasn’t sure as it sounded too risky. A Japanese cyclist had only died after riding his bicycle over the edge in June and I was there in August. Overall there has been twenty-three cyclist deaths on the road and on average twenty-six vehicles plummet over the edge each year (many of these vehicles are large buses so that’s a lot of fatalities). Although in it’s “prime” there was a death every two weeks apparently. 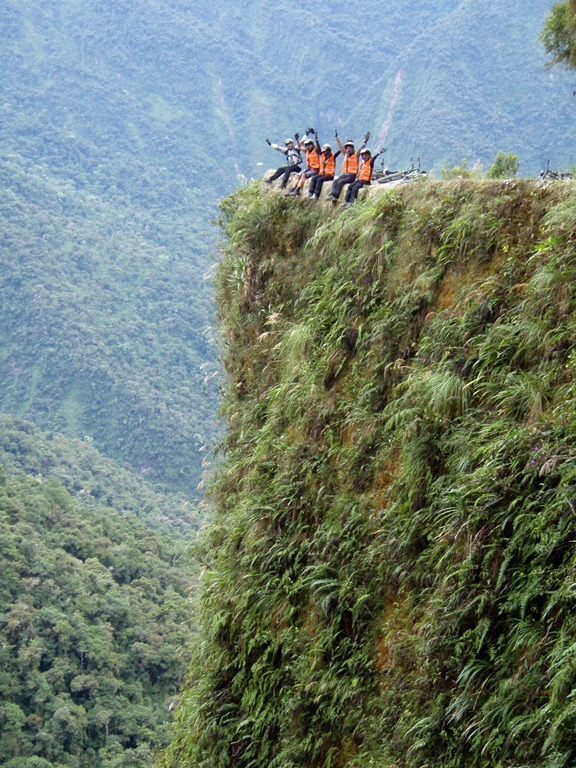 It was named The World’s Most Dangerous Road in 1995. ARGH. Also I always think if I am going to do something risky on my travels it has to be somewhere with good hospitals…and I don’t think Bolivia has any! 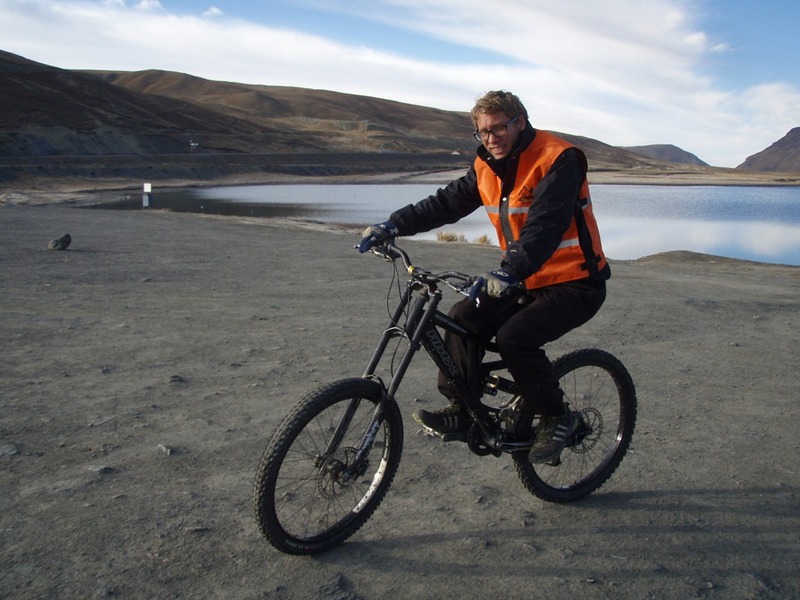 However after speaking to a few different tour companies and reading some helpful blogs and reviews I decided it didn’t sound too bad, if the company had good enough bikes my safety was in my own hands and I know I’m confident on a bicycle. 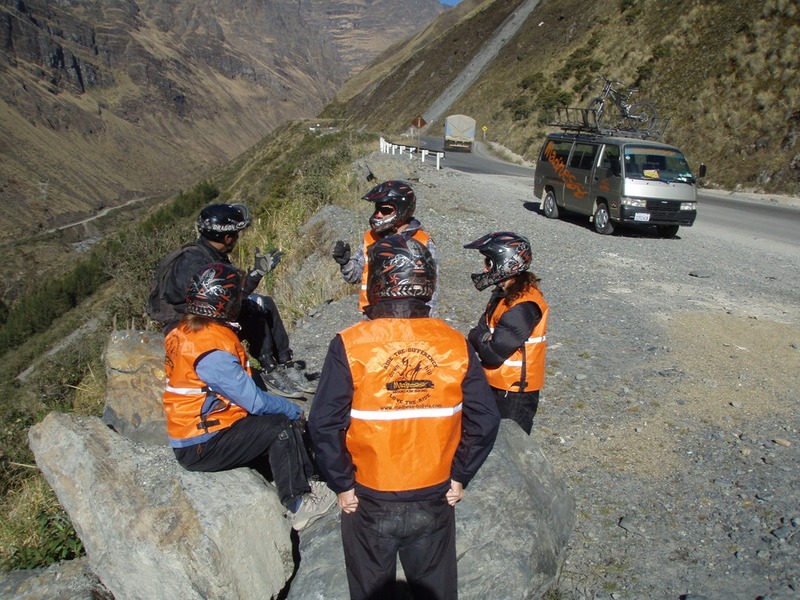 My main priority was to find a tour company which had a small group size because I didn’t want to cycle along the Death Road with twenty other cyclists not getting much attention from the guides and being left at the back. Therefore a company called Madness was the answer (the name didn’t put me off). I enquired at the well used company Gravity first, everything they said looked and sounded great but their group sizes were too large for my liking (they were really busy) so I settled on Madness. Madness offered a cheaper trip at 600Bs per person, smaller group sizes (there were four of us in total), the staff were friendly and helpful which made me feel more relaxed and ready to tackle The Death Road. 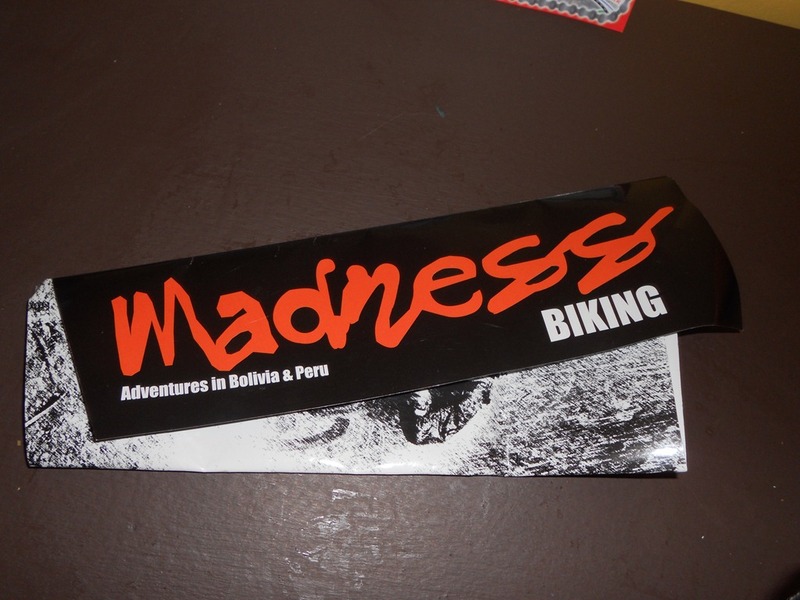 Plus like many of the other companies, Madness provide you with a free Death Road t-shirt (I thought this was fab), a buffet lunch at the end of the trip and snacks & water along the way. Oh and obviously the all important part….reliable equipment. A handmade Rocky Downhill Mountain Bike with full suspension if you want it (however I would 100% recommend it. 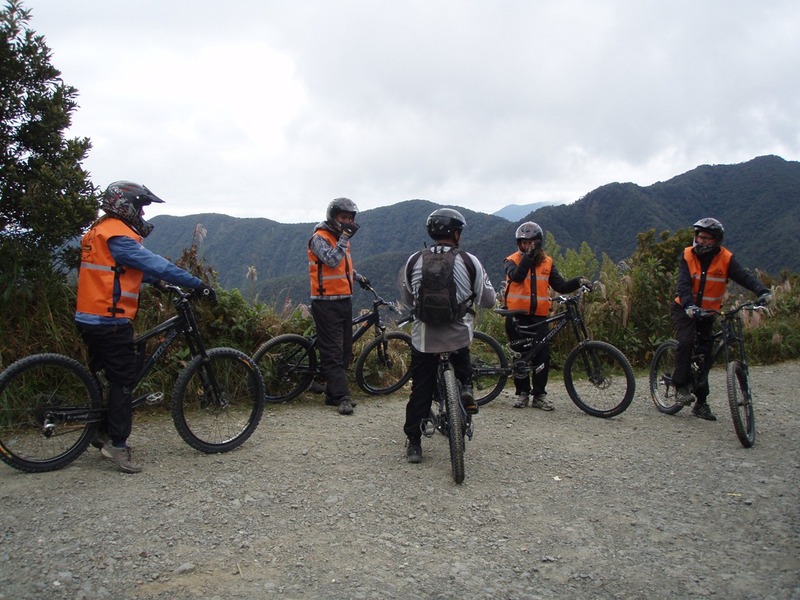 A Kiwi on our trip didn’t pay the extra for the full suspension and he couldn’t sit down at the end of the trip whereas everyone else could). So, where was I…..me and Tom wandered over to the Madness shop at 5.30am. It was too early for breakfast at our hostel so we’d grabbed some bread that we’d bought the night before. At the shop we met a Kiwi couple who were on our trip too. They made me a little bit nervous because I thought oh no adrenaline junkie Kiwi’s?! Oooh they’ll be cycling so fast I’ll definitely get left at the back! It was pitch black outside and really cold. 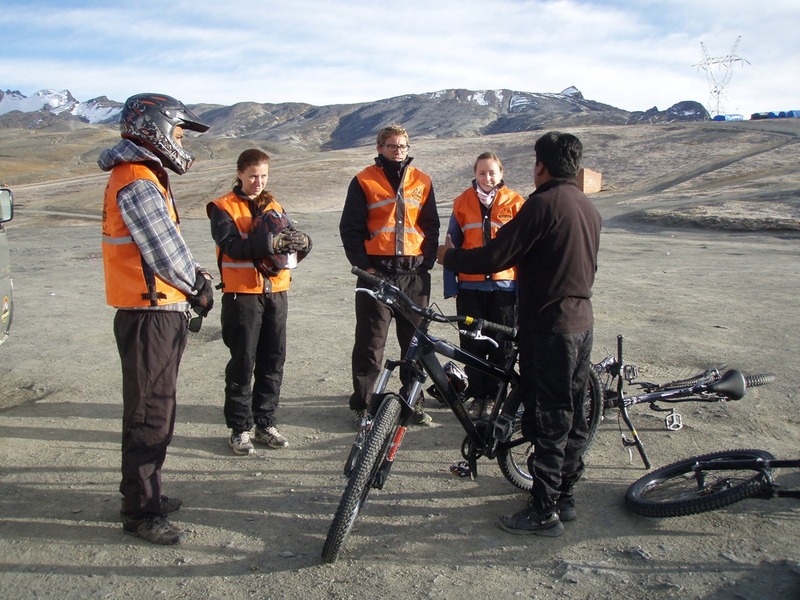 We all got given our equipment to check that it fit, a full-face helmet, full finger gloves (which I wore my own gloves underneath ready for the cold), long pants, a high visibility jacket and of course our bicycles. The seat had to be lowered as low as it could go for me and my short legs. 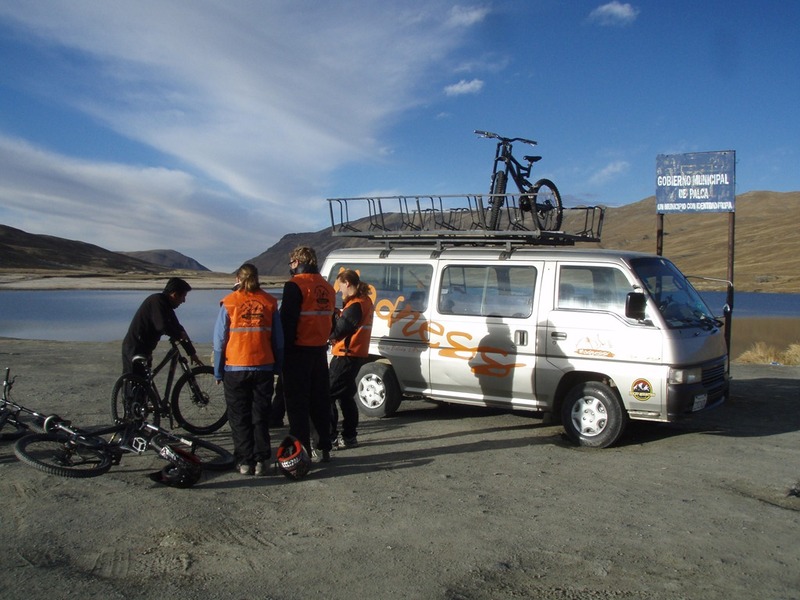 We had a safety briefing with our guide (who was funny and friendly exactly what you need) then it was time to jump in the van and get on our way. 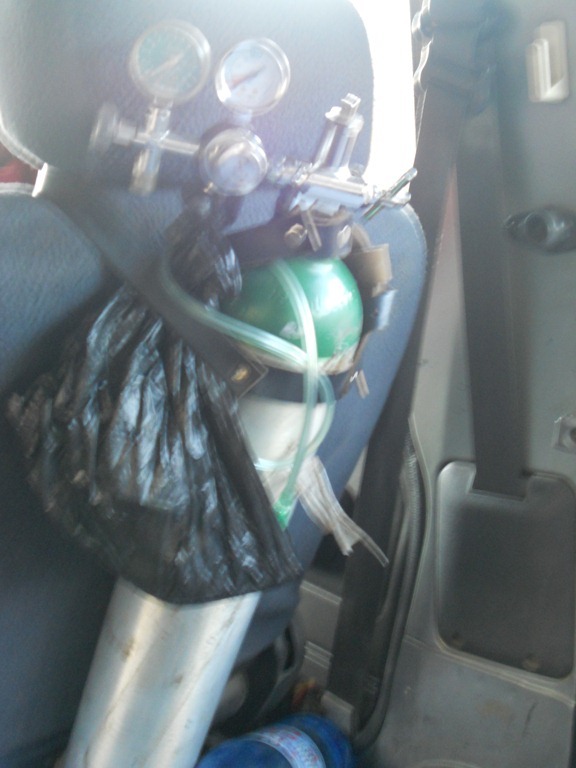 The sight of an oxygen tank in the minivan made me panic….although at least they were prepared! The drive was really pretty the higher we got and the further we went away from La Paz (which can’t be described as pretty). Lots of snow capped mountains and endless hills. 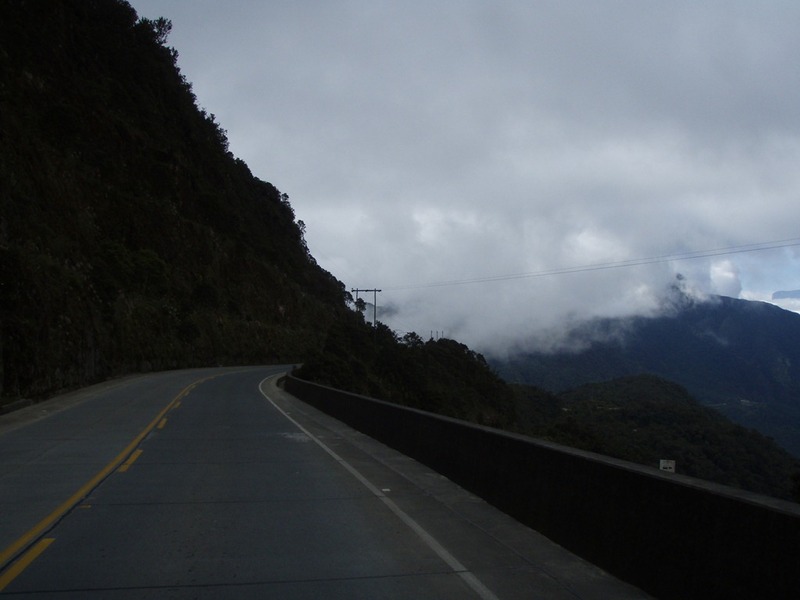 It was about an hours drive up to La Cumbre where The Death Road begins at a really chilly 4700m. 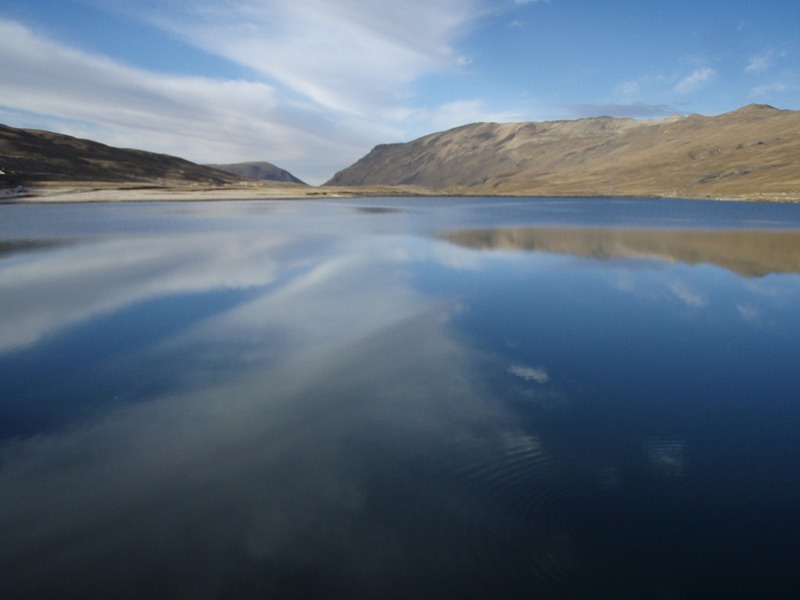 The minivan stopped in a large open space alongside a huge lake which was stunning. 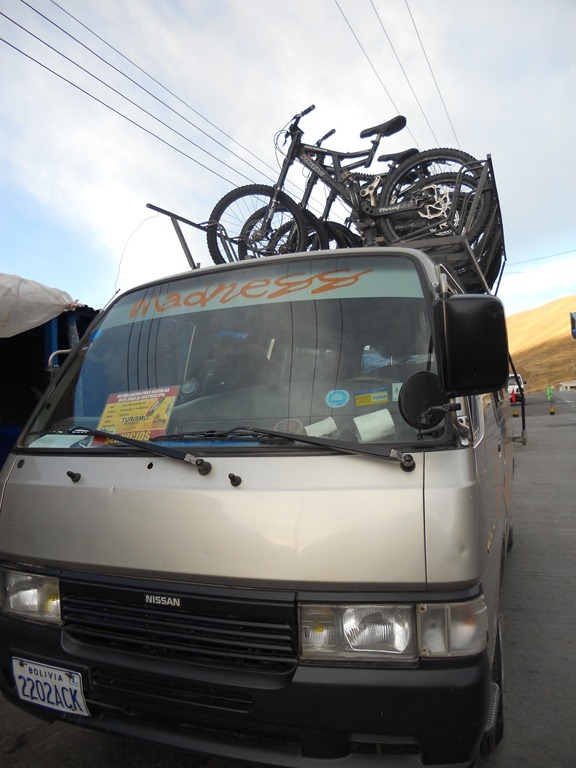 It all seemed really peaceful as the guides (one English speaking cycling guide and one Spanish speaking driving guide) unloaded our bicycles. Well, peaceful until this lorry drove past and we suddenly realised what we would be facing along the way! So. Much. Dust. We received another safety talk where the guide taught us his hand signals. He explained he would be stopping us along the way for further talks and sight-seeing! 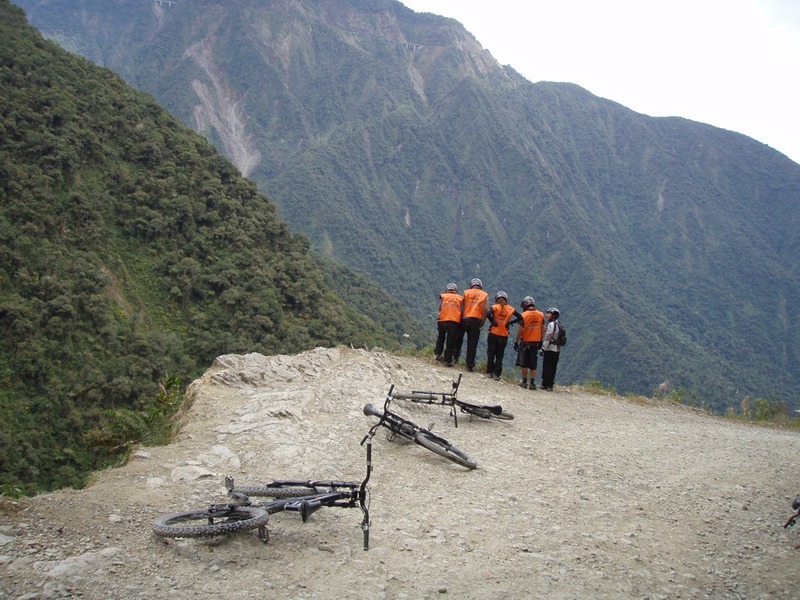 We were advised to ignore the gears just leave the bike in the highest one as the Death Road really doesn’t require any pedalling. I had to really remember which brake was front and back…I didn’t want to flip myself over the edge if I came to a sudden stop. In fact the guide kept telling us to try and brake as little as possible as it makes it even more dangerous. 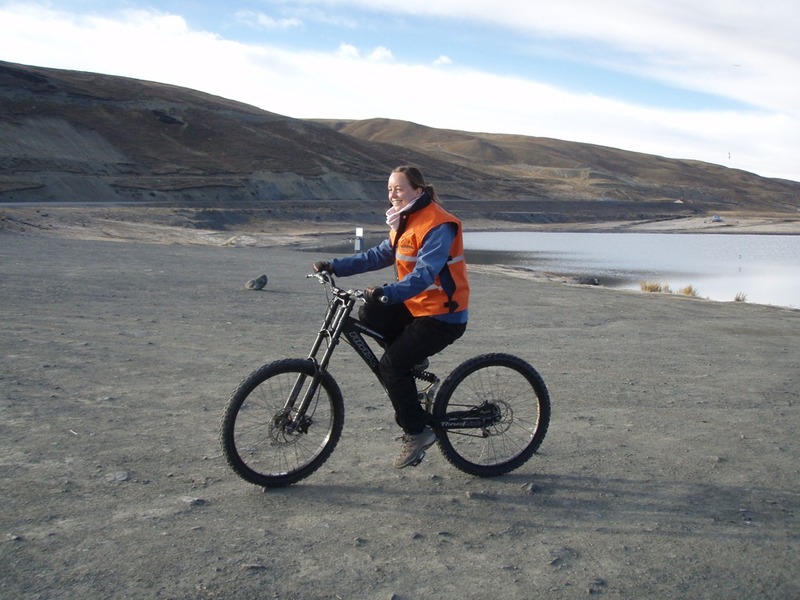 We spent about fifteen minutes practicing on our bicycles and having a few photographs taken. 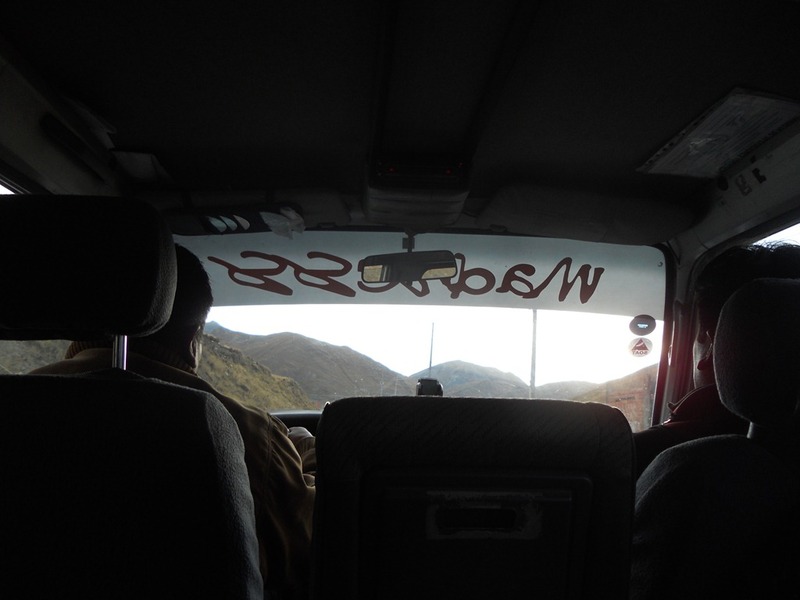 That was the excellent thing about the driver, he had a digital camera which he took tons of photos on throughout the day. At the end of the trip each of us got a CD with the photos, so you don’t need to worry about taking any of your own and falling off your bike! 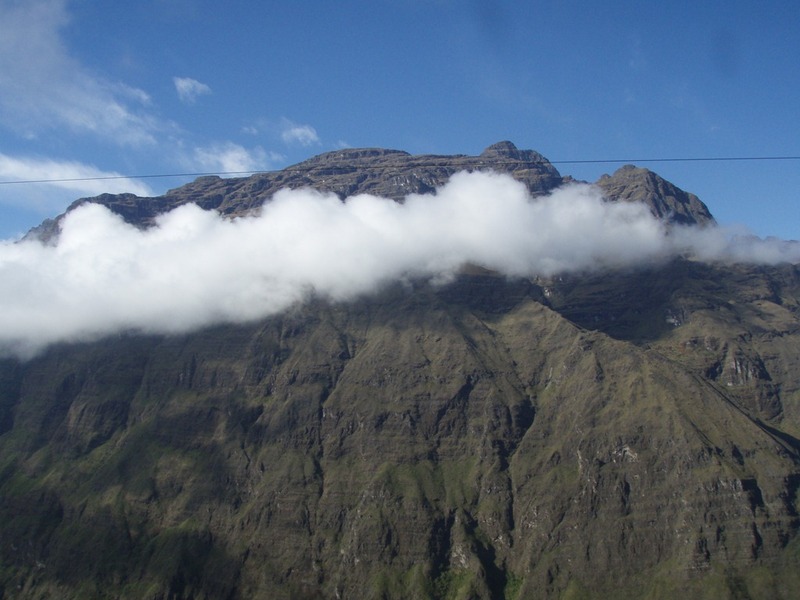 Ready for The World’s Most Dangerous Road aka The Death Road! 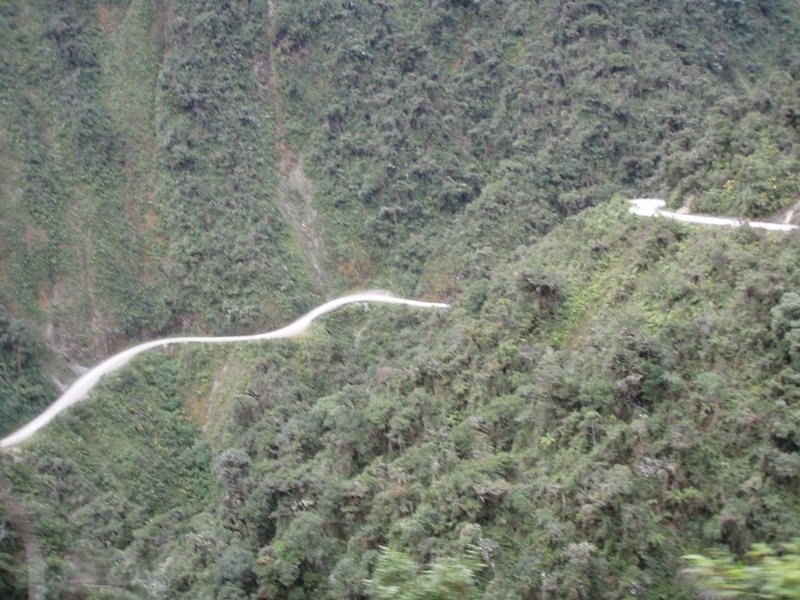 I must stress that the start of The Death Road was absolutely FREEZING. Underneath all of the gear Madness provided I had a few layers of my own clothes too. Lots of thermals and even a hat under my helmet. Your toes, face and fingers get the coldest as they face the icy wind. I managed to squeeze a pair of gloves under the Madness biking gloves but my fingers still went numb. My heart was pounding when the guide told us our practice was up and we must make our way to the start of the road. 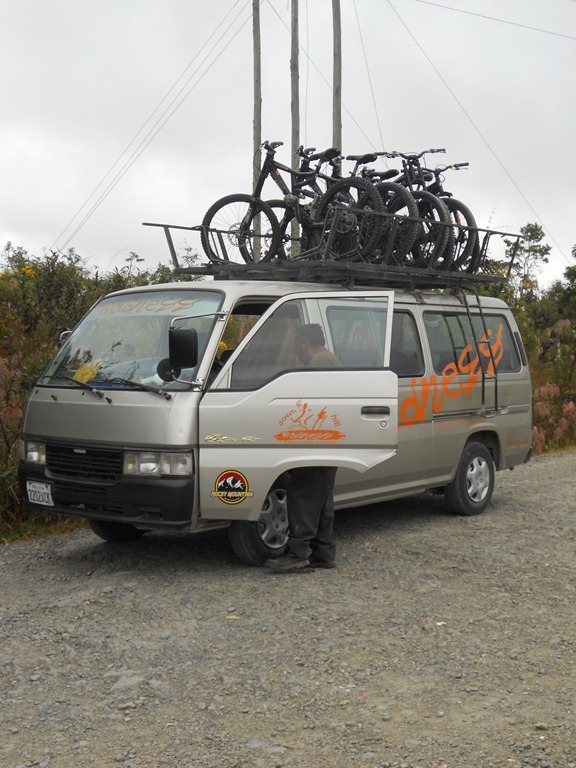 We crossed over to the right hand side of the road on our bikes, with the driver following us in the minivan. I immediately took up a comfortable position at the back. The first part of the Death Road is technically the new Death Road and it’s no longer the dangerous road it was. It has been widened and it’s all smooth tarmac with road markings and road barriers. This was good in one way because it’s comfortable and safer BUT because it’s smooth tarmac it is FAST, oh so very fast, you have to be really careful because you can get up to quite some speed. 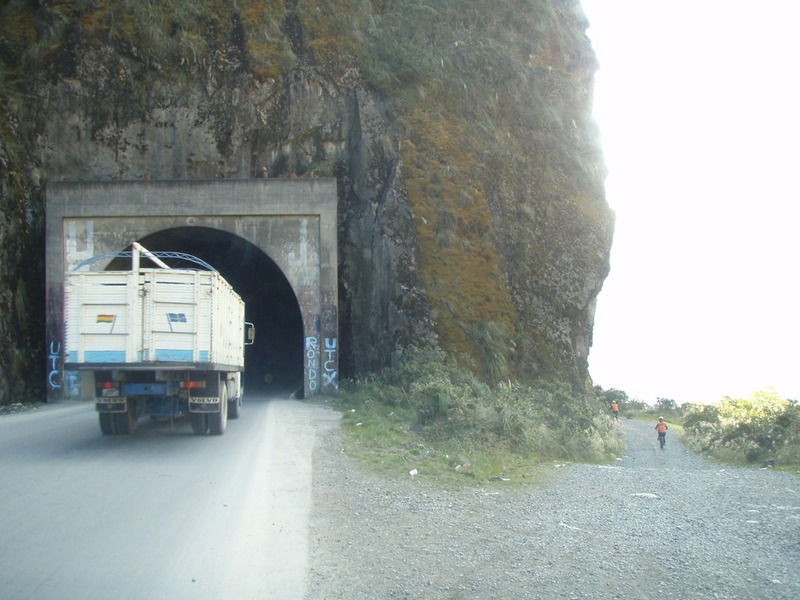 Also this part of the road is still a main road from La Paz to Coroico so it’s quite busy with lorries, buses, motorbikes and cars. Although at the early hour of 7am it wasn’t too bad we only had to do a little over taking. The guide would always wait for us to catch up then we could slowly overtake together. The guide, Tom and the male Kiwi went so fast down this part of the road I could see them a few corners below, it was crazy. There was a huge gap between them, the female Kiwi and myself. I reckon the guide driving the minivan was really bored following me! I wasn’t going slow but I was using my brakes….that was the difference between me and Tom, he rarely used his brakes and I used them a lot. This part of the road was a lot of fun because the views were absolutely incredible. 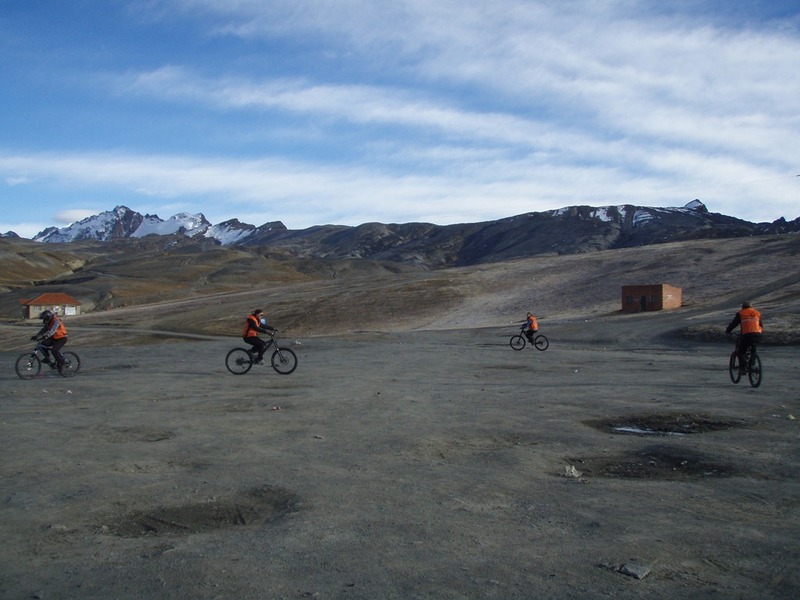 Despite being blasted with cold air and having to really concentrate on my cycling I managed to clock the ever present Andes. 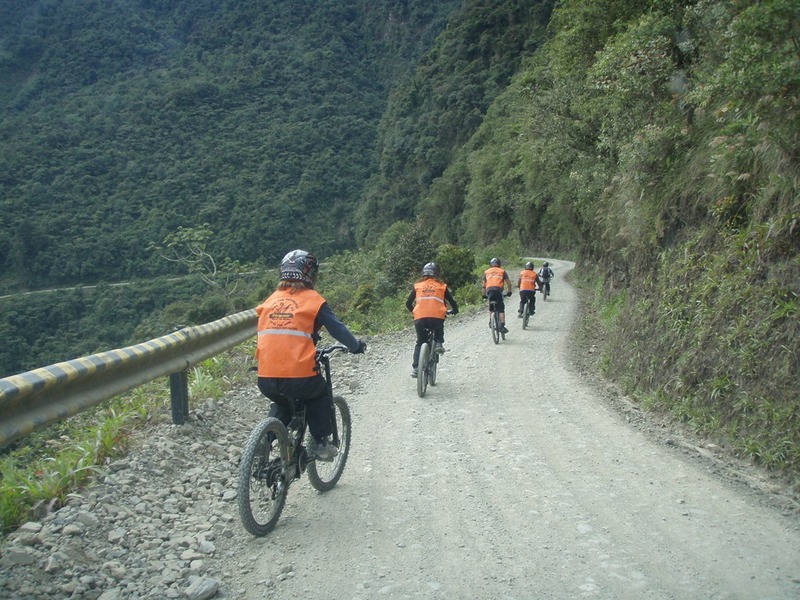 Every now and again along the way the guide would stop us and give us some tips on our cycling and some lovely horror stories about the Death Road. That means he stopped us a lot because there are many Death Road horror stories! 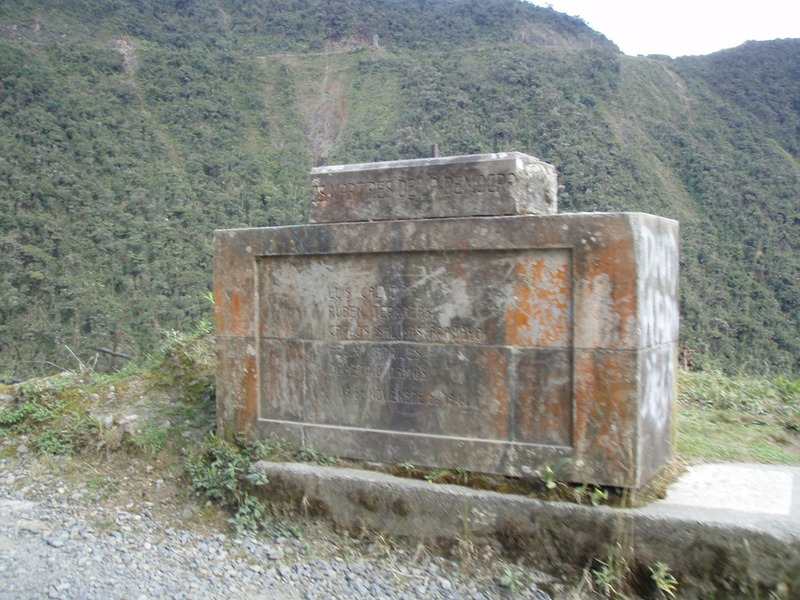 The first time we stopped, on the new part of the Death Road, we looked over the edge to see a large bus crushed at the bottom. The bus had crashed over the edge of the new road killing everyone on board. I just couldn’t believe it because the new part of the road felt so safe with the barriers and tarmac! That just shows the type of crazy drivers Bolivian’s are. The Death Road’s a windy 64km of constant downhill (you never pedal until the very end, really it’s the laziest bike ride ever). 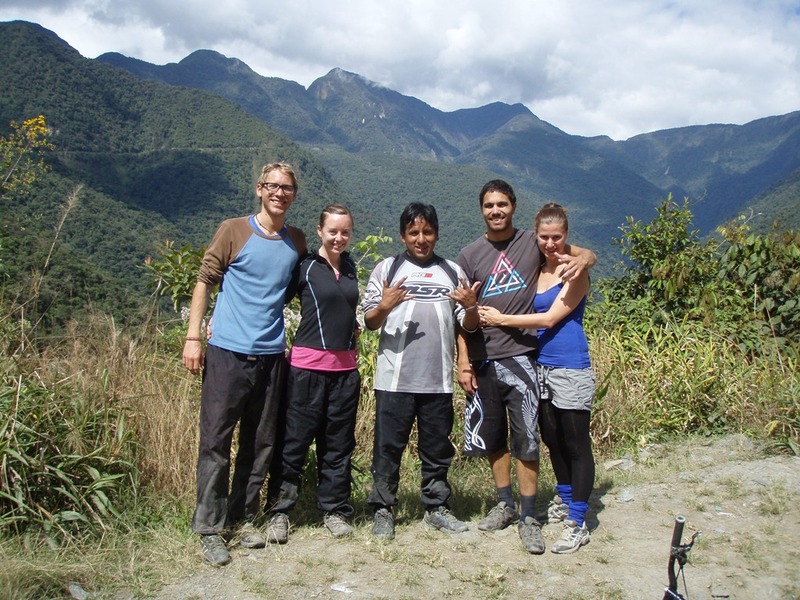 You also descend 3345m from freezing Andean temperatures to a warm and sweaty jungle temperature. 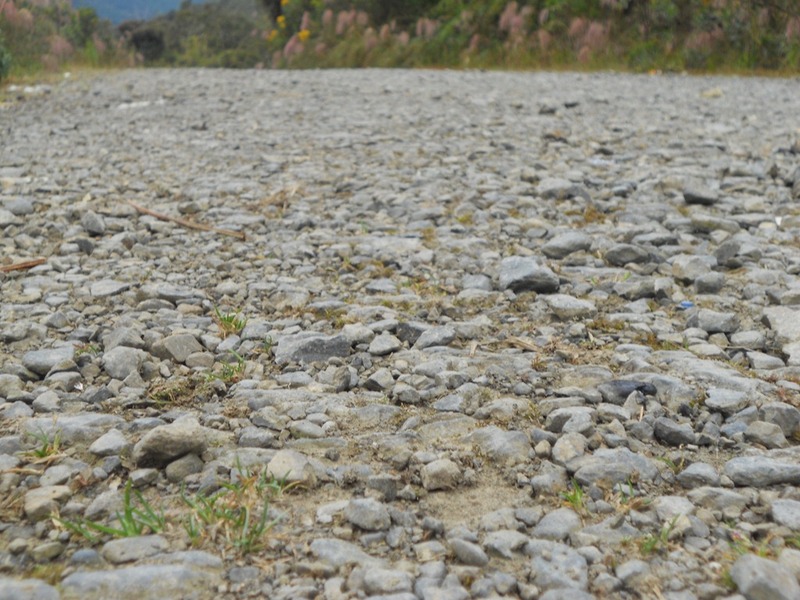 We said goodbye to the comfortable smooth tarmac and hello to the bumpy and much more dangerous original Death Road. 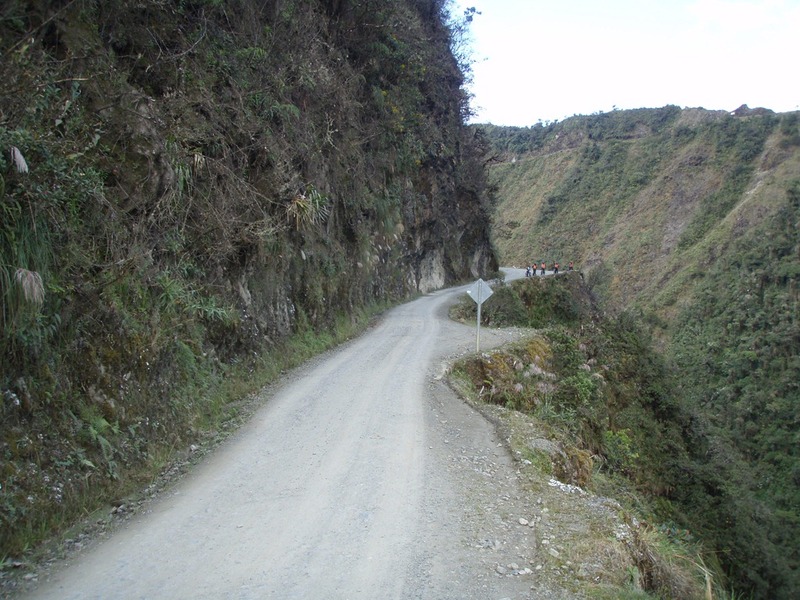 The original Death Road is still open to traffic but you don’t have to drive on it, you can continue on the newer, safer, tarmacked road. 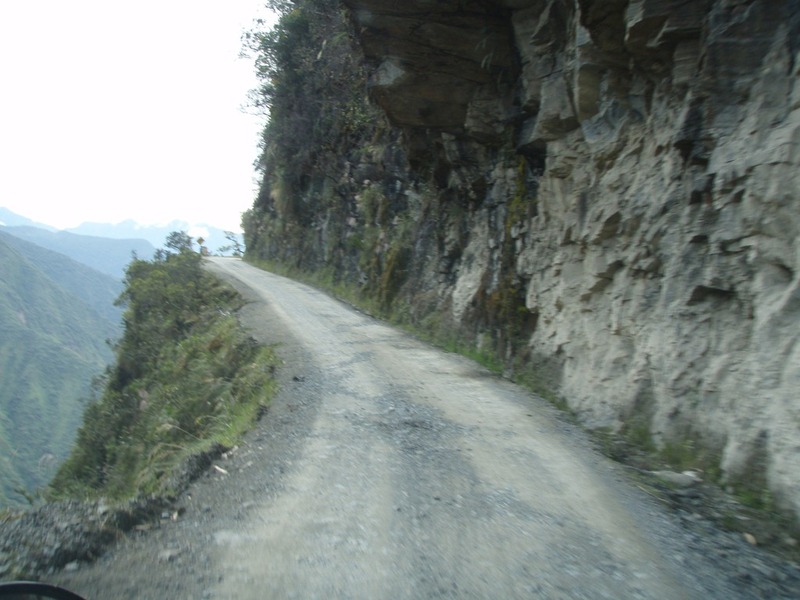 However our guide told us that many Bolivian’s ignore the new road because it adds 30 minutes to their journey. Can you believe it?! Shall I set off earlier and LIVE or shall I risk DEATH and continue to drive on the quicker, narrower, bumpier, scarier Death Road? I know what I’d do! Our guide gave us another safety briefing as this was going to be the toughest and longest part of the day. He really stressed to us (especially me) that we must not brake too much because braking on the gravel could easily make us skid and fly over the edge. The road was going to get windier, there was going to be lots more twists and turns plus maybe some oncoming traffic. I shivered at the thought of meeting a bus around a corner. 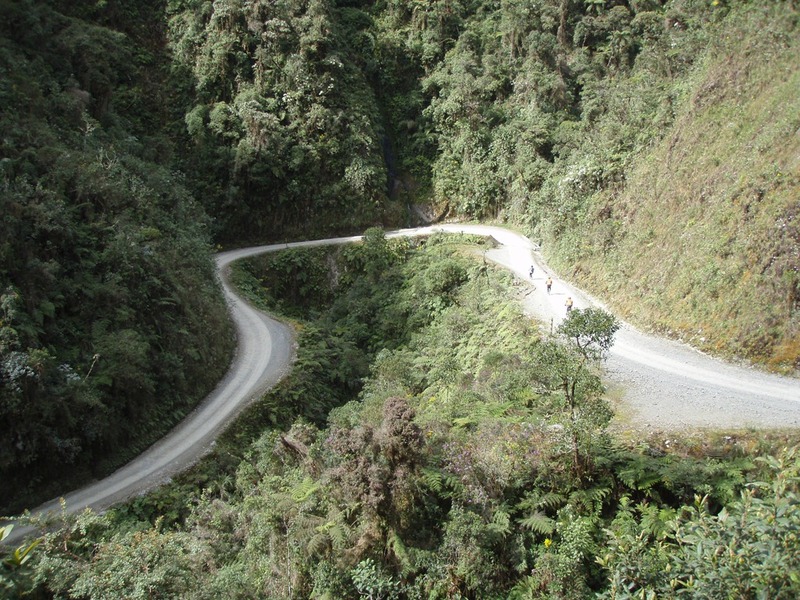 The original Death Road was really difficult to cycle because it was incredibly narrow. You really have to concentrate otherwise you could hit a bump and crash over the edge. It was so hard to find a comfortable track to follow. I stood up on my pedals most of the way because it was really bumpy. It really takes it out of your arms because they are really tense on the handle bars. It was hard not pressing the brakes all the time. I just had to get used to cycling fast. As the journey progressed I got a little braver and went a little faster. I just don’t know how Tom managed to go down it so fast and not fall off. 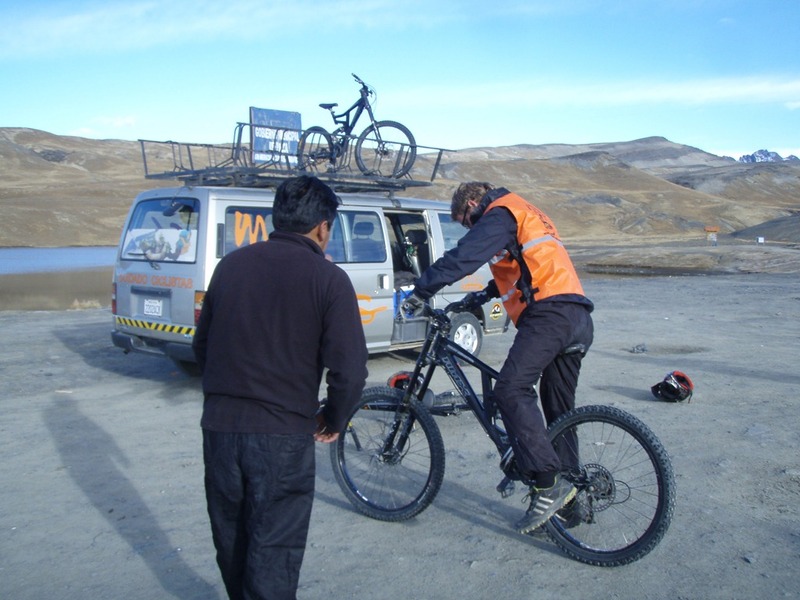 The guide was crazy, he would ride really fast with his hands on his head…..obviously much more used to the road than we were. A particularly scary part of the road are the “Corners of Death”. Yes, they are really called that as it’s an area which has suffered a lot of fatalities, this includes some cyclists. It’s a pretty steep section with some quick turns. You look over the edge and the trees hide plenty of severe drops. The guide stopped us along the way to tell us more horror stories. He also had a few videos and pictures on his phone showing crazy drivers trying to pass each other. 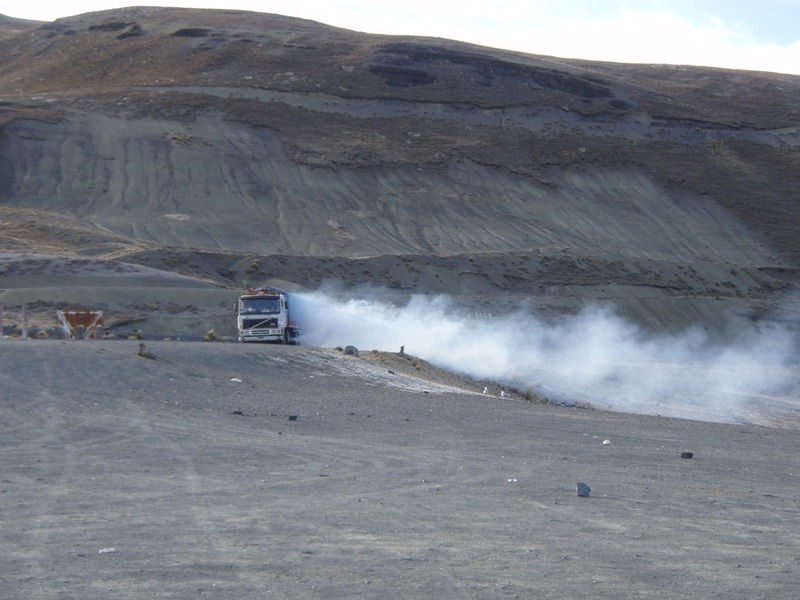 The original Death Road is barely wide enough for one car SO to see two lorries trying to pass each other with their wheels hanging over the edge was INSANE (this was on the guides phone, thankfully not when I was there). The guide told us about one coach which was too heavy and too wide for the road but it still drove along with a coach full of passengers. Unfortunately the edge of the road gave way and the coach tumbled over the edge killing everyone on board. Another story and another coach with a drunken driver who was going too fast and the passengers felt unsettled (very surprising as the Bolivian passenger seems to put up with a lot). They knew he was drunk and he was nearing the San Juan waterfall section so the passengers demanded he stop the coach to let them off, they were going to walk this part. The passengers walked and watched as their coach with their driver and belongings rolled over the edge. The day continued with more downhill (I was starting to forget what it felt like to pedal a bicycle) and more photographs. The driver took some fab ones of us posing on the edge of some HUGE drops. 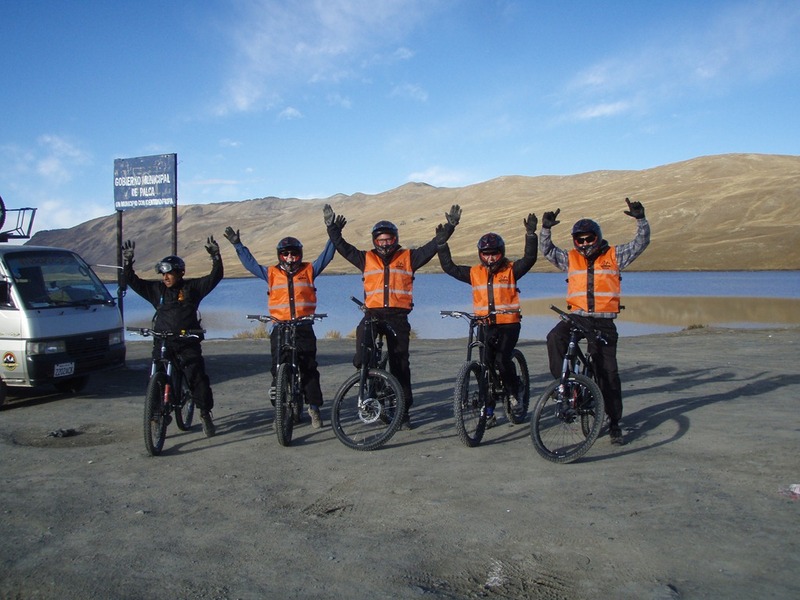 When the guide told us to lift our bicycles up onto one wheel and smile for the camera I thought this was it…I’m going over the edge. The guide had to put my bicycle into position for me as I couldn’t do it without it moving forwards (also I’m pretty weak haha)! Scary! But what a great photo! A classic group jumping shot. Tom is the person in the middle jumping really high….he seems to have no fear. 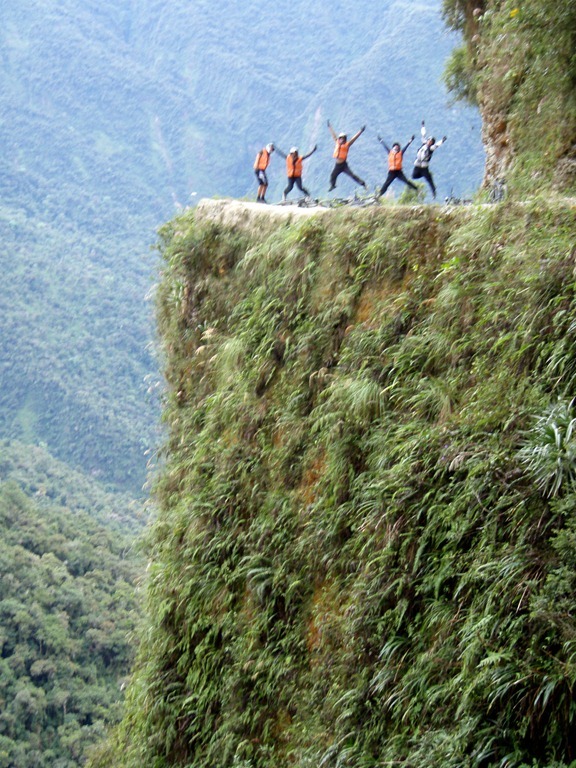 I’m second from the right….pretty far away from the edge, that was my idea! Gaah, this photo was testing. The guide said right lets do one sat on the very edge. He obviously does this every day so no big deal. EEK! I crawled over…it actually didn’t seem too bad when you sat in position because there are so many plants. I was convinced I could grab on to one if I went over. 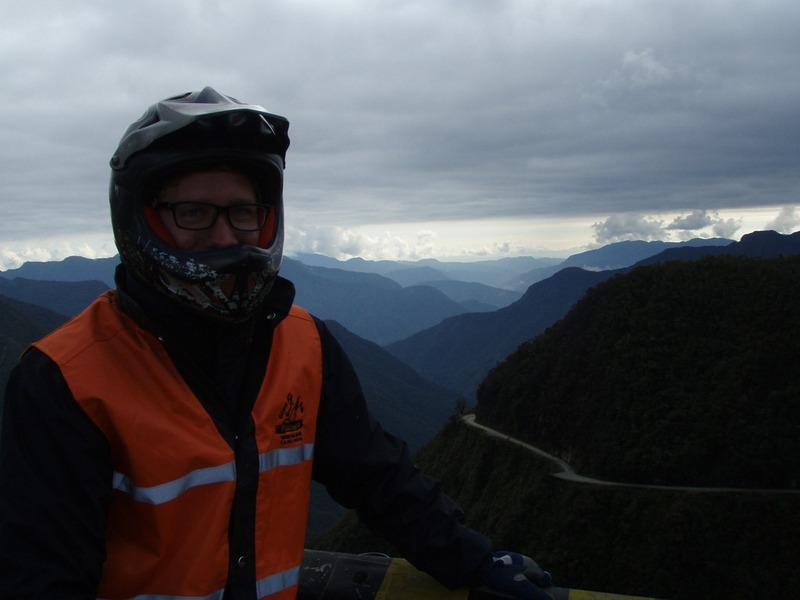 I just love this photo, sat on the edge of The World’s Most Dangerous Road with the surrounding Andes, a great memory. 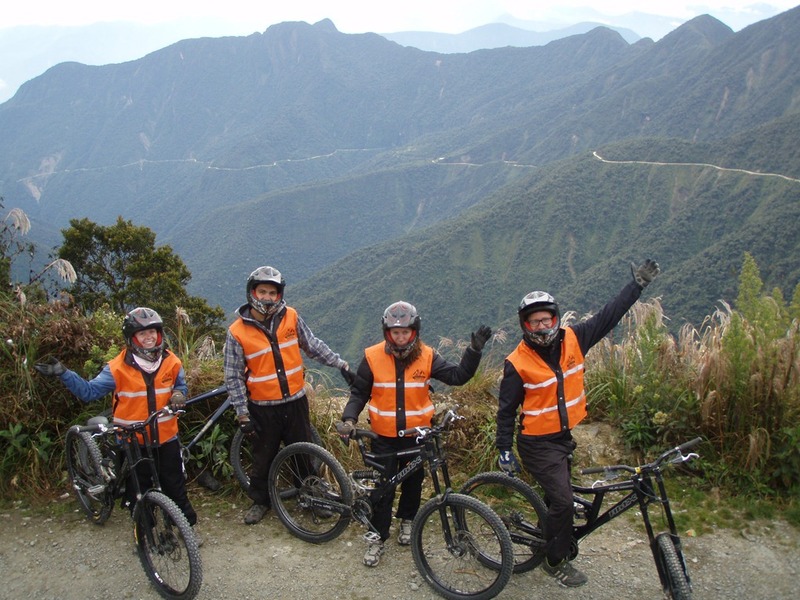 However we’ve still got some more Death Road biking to do so it’s back onto the bicycles. Unfortunately you do pass many, many graves along the way. At the San Juan waterfall the sides of the road are just covered in them. The guide told us that the graves get blessed throughout the year to remember the people who had died. 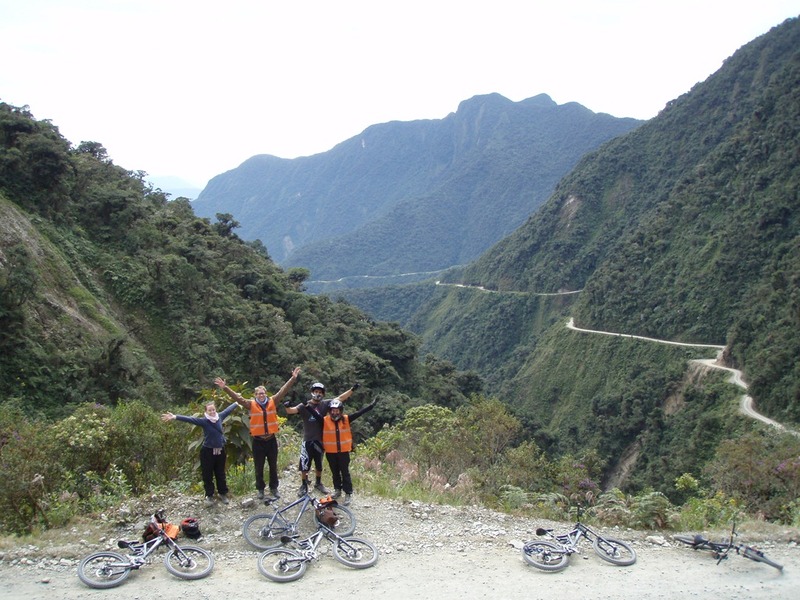 We cycled down the Death Road for about five and a half hours, a very long time to be on a bicycle. My arms ached and my bum hurt. 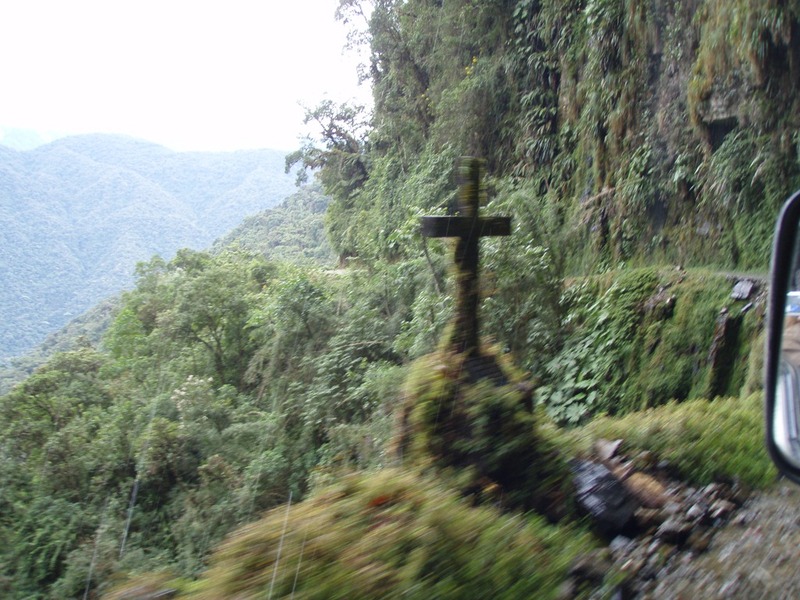 Nearing the end of the Death Road you pass through some small villages. Our guide warned us to watch out for wandering chickens and goats. There was more traffic here so a lot more dust which was horrendous. I just pulled over and waited until the dust had disappeared because it made breathing difficult. Also the temperature was HOT. We had all started to delayer as we were seriously sweating in our thermals at the new jungle temperatures. There were mosquitoes too which is never a good thing. Plus there was an UPHILL part!! Can you believe it?! It was only small but in the heat and with achy limbs it seemed tough. I was starting to prefer the colder, faster Death Road. I’m happy to say that we all made it safely to the bottom with no-one falling off. Well, that was until the guide got the Kiwi and Tom to try a jump he had made and the Kiwi took a tumble. 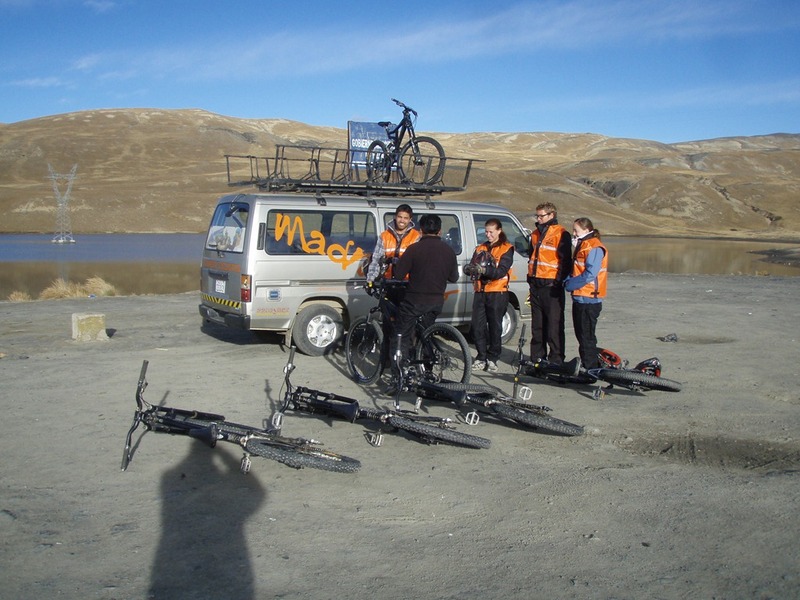 Plus we never met any other cycling groups along the way because we’d set off so early. We were actually the first group to make it to the bottom, a nice surprise. 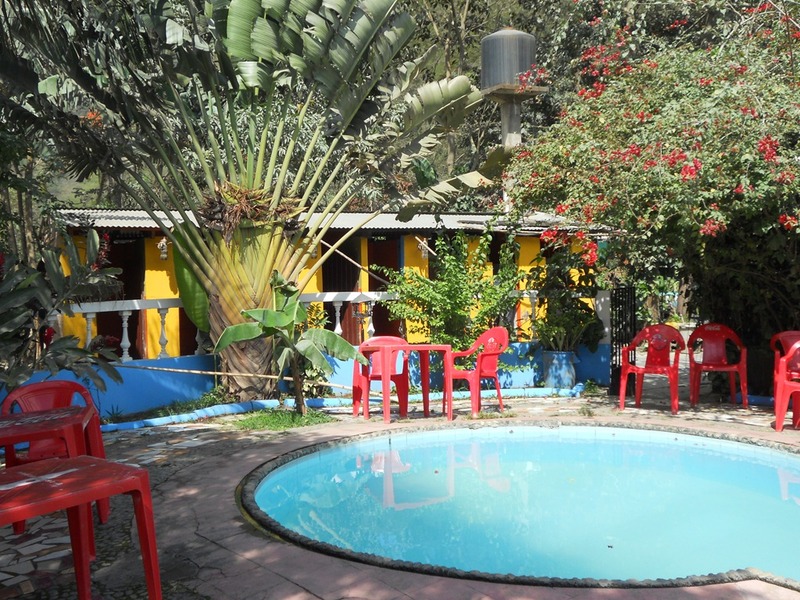 A Bolivian buffet lunch, a shower and a nice cold swimming pool awaited us at the bottom in Yolosa. A great way to relax before jumping back in the minivan and driving all the way back up to freezing cold La Paz. 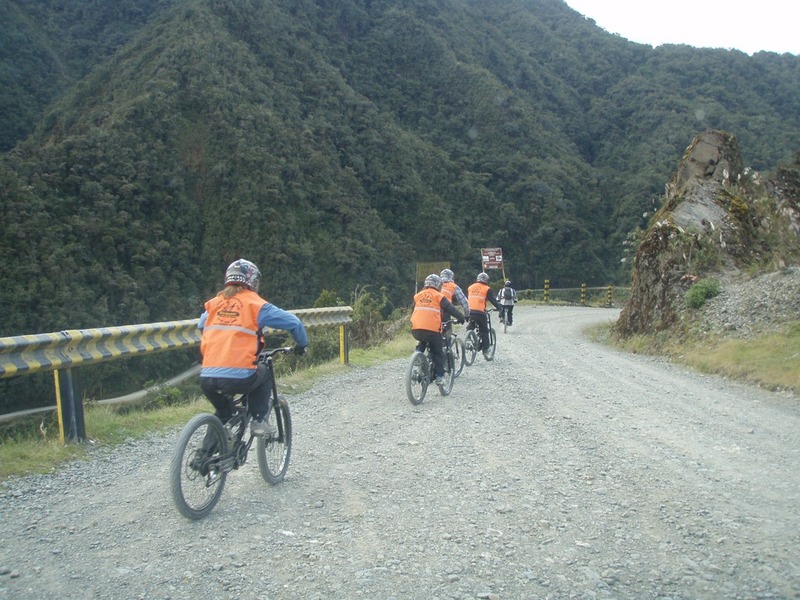 On the way back we drove along the new, safer Death Road so that we didn’t cause anymore traffic for the cyclists still cycling down the Death Road. 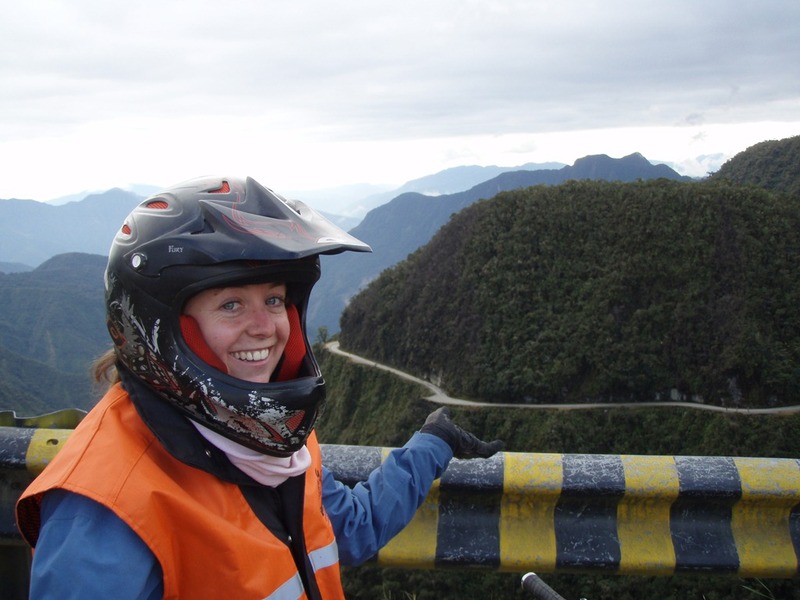 My time on the Death Road was fabulous/chilly/fun/sweaty/dusty/dirty/stunning/achy/jaw-dropping/interesting and surprising! I’d recommend it, even if you’re a bit scared like me it felt great pushing myself to do something difficult. 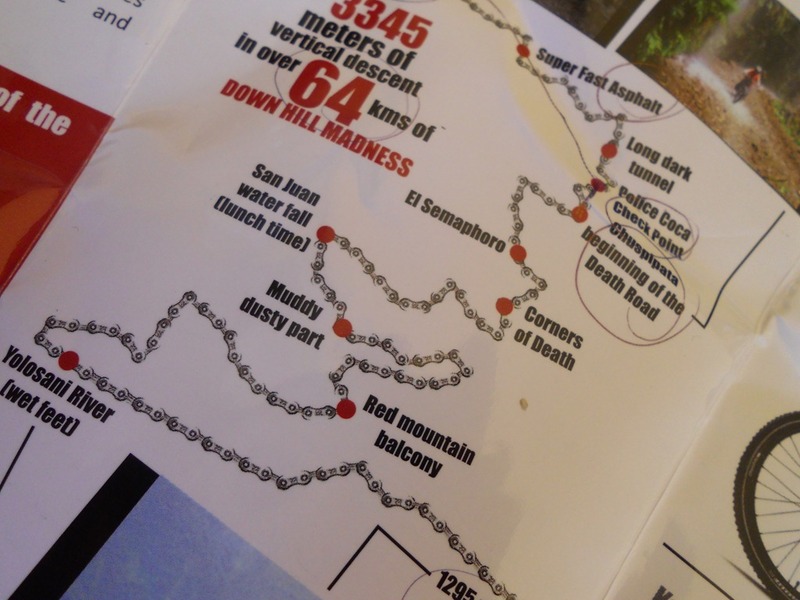 If you fancy a hair raising trip along The Death Road with Madness have a look at their website. Check out my previous blog post about somewhere a lot safer…Taiwan. 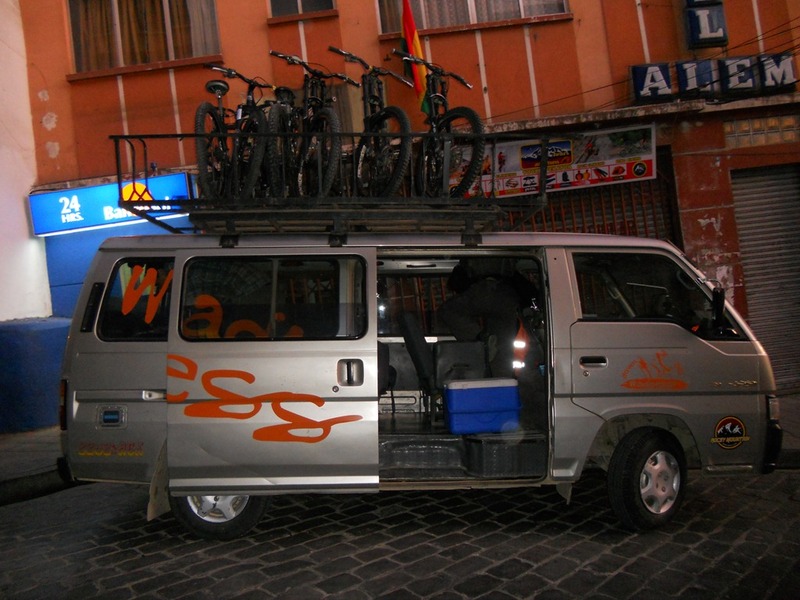 And finally if you want to see some more photos of Bolivia take a look at wildyellowbelly’s Bolivian page.